Traditional Uses: anxiety, depression, purification, protection. 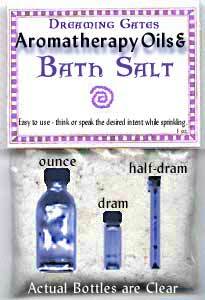 Bath Salt - 1 oz. Bath Salt - 4 oz. Cinnamon is used in aromatherapy and magick to ease anxiety, breathing, depression, flu, and colds; have antiseptic properties; increase luck, lust, prosperity, psychic powers, and purification. Methods: rub a little on the skin, put some drops in hot water, inhale the aroma from the bottle, annoint a candle for ritual, or dab some on the corners of a written wish or spell. History: Fragrant oils have been used to perfume and medicate the body since before the time of Christianity. Ancient Romans used scented olive oil for both fragrance and cleanliness, while ancient Greeks used herb-infused oils for medicinal purposes.